I've been using Vuze for about a year now (beta and stable). I've recently picked up that although I'm not seeding anything and I have no torrents queued, Vuze still uses about 350MB every hour for uploading and downloading. I'm unsure why it is doing this? I thought maybe it was something to do with the beta, but moving to stable does not change this. Vuze itself shows download speed of maybe 15 B/s and 0 upload, but NetBalancer shows download of around 40kB/s and upload of 50kB/s. What could be uploading and downloading in background? I only have a 90GB bandwidth allocation a month, so I'm sure you understand my concern with this. I also concerned that my Vuze is misreporting the bandwidth it is using. Please assist me in solving this worrisome situation! I doubt you are running that many torrents. So where did you get the 350 MB from? I do not know how NetBalancer works but I suspect that something is missing here. Like NetBalancer is reporting in kbit/sec not kByte/sec or that you were actually uploading on a torrent or something and did not notice or that NetBalancer is really reporting in bit/sec or Byte/sec. Or that NetBalancer does not deal with low speed data effectively and thus over-reports it or whatever. The handshaking packets and announce packets are in the 100 Byte range or so (actually closer to about 80 Bytes I think). So my calculation was off by a factor of roughly 1000 LOL. So you would need to be seeding about 7,900,000 torrents to generate 350 MB of data an hour without uploading data to other peers. Maybe I got that wrong but it is in that range of roughly 7,900 to 7,900,000 torrents to generate 350 MB data per hour. Now if you are calculating the 350 MB from the speeds you are seeing . . . and the speeds are actually in bits/sec rather than KBytes/sec that would lower the amount of data by a factor of 8,000 which then gets into the range of possibilities of you generating roughly 44.8 KBytes of data every hour which would only take about 1000 torrents or so. Again I think there is a misunderstanding somewhere. It is probably that NetBalancer is getting something wrong or that it is displaying something incorrectly or that you misread the speeds or whatever. The roughly 12 Bytes/sec that Vuze is reporting is more along the lines of what makes sense according to the protocol. Thank you for that very detailed explanation! I learnt quite a bit from it. 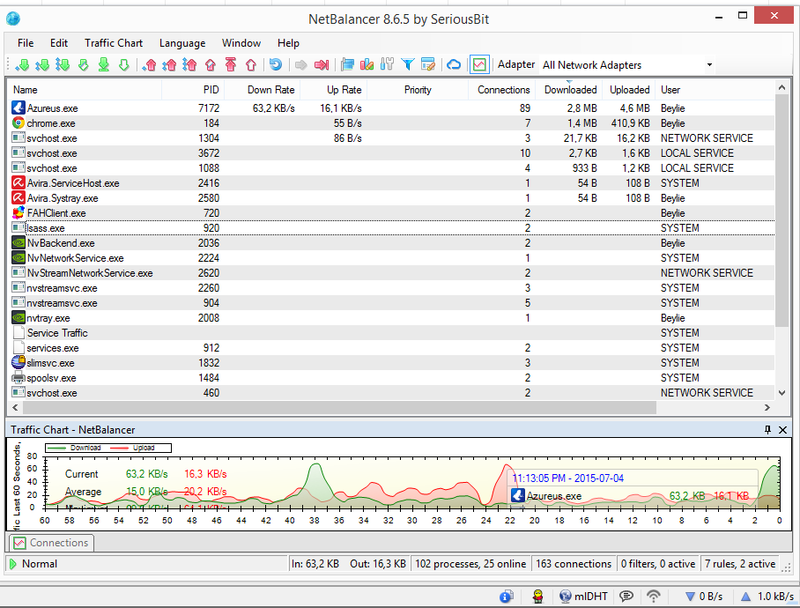 As you can see NetBalancer is reporting 63.2 KB/s and 16.1 KB/s. Vuze is reporting 0 B/s and 1.0 kB/s. I've double checked NetBalancer's settings and it's definitely set to KB, not kb. In the time it took me to reply here Azureus.exe has used 26MB and not a single one of the 7 torrents I have seeding are being leeched. NetBalancer has a Connections button that I now used. The data is definitely being used although not by the torrents themselves (seeding or downloading anything). I have many connections (89 in screenshot above) and new ones are constantly being made and broken from all over the world. Is my client sending info about the torrents I have every time someone connects? I thought the tracker announce was done once in x time (for these torrents it is an hour). Here is a screenshot. Note that Vuze is showing 0 traffic, but NetBalancer shows that it is indeed using bandwidth. Does Vuze not report on announce (unsure what it is called) traffic? (07-04-2015, 02:24 PM)'beylie' Wrote: Does Vuze not report on announce (unsure what it is called) traffic? Yes!. Vuze does use "overhead" data and it is referenced as "protocol" data. Go to OPTIONS > INTERFACE > DISPLAY > display Units, and you see a couple of tick boxes for data and protocol statistics. If you tick the box for "show separate data and protocol statistics" you will see in the Vuze tray the amount of "overhead" (protocol) data that is being used as well as data for content download/upload and depending on the piece size and peer connections per torrent, the protocol or overhead usage should be in the range of 0.2% - 1.0% for downloads and if your connection is asymmetric as most domestic connections are, the upload protocol will be in the range of 1.0 - 5.0%. I can only concur with garyE's assessment of protocol usage if you're using 350MB per hour. Something is not right in Paradise!. Both he and I run many, many hundreds of torrents and Vuze copes extremely well. There is something else nibbling away at your bandwidth and data consumption. Try using a utility such as Sysinternal Suite (https://technet.microsoft.com/en-us/sysi...42062.aspx) or Security Task Manager (http://www.neuber.com/taskmanager/taskmanager.html) to investigate system load and determine if there's a gremlin chewin' away at your bandwidth. I thank you guys for the awesome responses! I've removed all (7) torrents I had from Vuze, but alas, the bandwidth usage did not change. Almost like there was a torrent that disappeared from the gui, but was still active in the background. I decided to trash my Vuze installation and started from scratch. It seems to have solved whatever the issue was. There is still bandwidth being used, but it intermittent (vs constant previously) and very low (80kB in the last few minutes). I'll keep an eye on it and revert should I pick up anything untoward. I'm downloading the apps above out of interest anyway. I appreciate the time spent on this by you. Maybe you have started typing something on Vuze which turned out to be filled in the "filter" field, filtering the torrents on your list, from time to time I ended up doing it here. (07-05-2015, 01:54 PM)'Havokdan' Wrote: Maybe you have started typing something on Vuze which turned out to be filled in the "filter" field, filtering the torrents on your list, from time to time I ended up doing it here. Yes, Good point. I forgot about this little minefield. I have also fallem prey to this mishap. I would like to see it as a toggled item. Current time: 02-05-2019, 12:18 PM Powered By MyBB, © 2002-2019 MyBB Group.